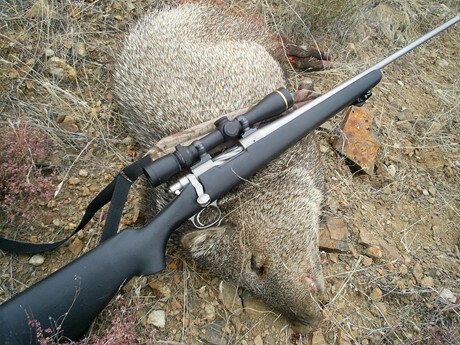 This javelina hunt would take place in very familiar territory, but under quite different conditions. 20A is my darling when it comes to hunting down a pig. Over the years we had drawn tags many times, and someone had always been successful. But in 2006 there wasn’t a “we.” Mine had been the only name on the application. My buddies had opted out primarily due to lack of employment at applications time. When on opening morning I arrived at ‘our saddle,’ where we’ve always made camp, daylight was still at least thirty minutes away. And nobody else was around, either. I like it when I have hunting ground all to myself, even though more people increase the odds that somebody stumbles into the herd(s). So, still in darkness, I leisurely eased along the familiar cow path to a knoll that seemed ‘deep’ in porker territory. As in previous years, I first strained ears and as daylight became dominant, also eyes to detect – well, nothing! So, after about an hour of nothing, a move to the next hill became necessary. By the way, a week before the hunt I had settled the “what to carry” issue with the realization that I really wanted to bag meat. So the Remington 700 in .308 Win got the lucky nod. Being the Titanium Model, its super light weight makes it almost a joy to carry. At the next hill three mule deer put an end to nothing, but still no signs of javelina, except that the dirt clearly indicated that they had been all over at some time. When that might have been was too difficult for me to tell, since Arizona had not seen rain for over 110 days prior, an ugly record. I traversed the north-facing slope, becoming ever more hopeful since tracks and older rooting signs seemed abundant. But even with throwing rocks down steep slopes no pig came in sight. This hill or little mountain is almost circular in shape. The east-facing portion has many little ridges running down. Following this terrain isn’t easy because nowhere is flat ground. Ascending yet another small ridge, a sound made me freeze in my tracks. 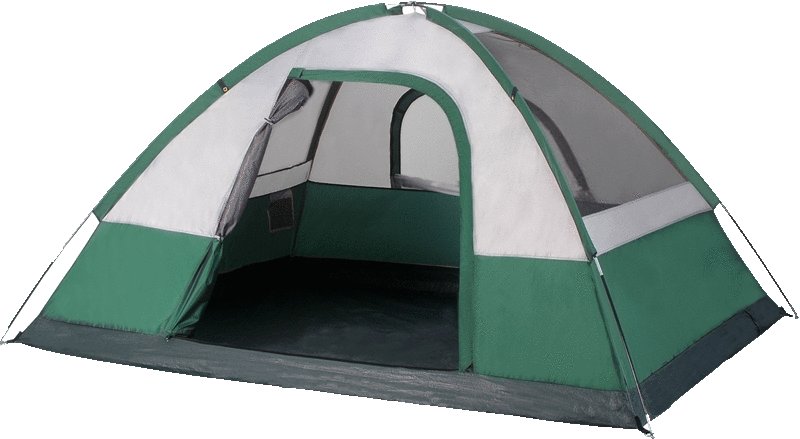 The wind, not strong but gusty, was in my face, and the noise certainly sounded like something heavier, such as a peccary or deer. But there had only been that one noise. My imagination? A trick from the wind? I could not tell. Minutes ticked by. Then another noise. Could it be feeding pigs? Did I just want to hear such ‘information’ from the wind? Damn, I wish the wind would stop, so I could hear better. I certainly saw nothing. After what must have been almost ten minutes of waiting, of straining my ears and eyes, the wind carried the give-away, a single “whuff”. Javelina, no doubt! Carefully, but with purpose, the rifle came off my shoulder. And since I was certain that I had remained undetected, there would be plenty of time for a careful shot. So the Leupold setting increased to 6X. More minutes passed before finally, about fifty steps ahead, the first porker appeared, still covered by brush. I had time. They clearly were in feeding mode. The first ‘open’ critter appeared small, so I passed. Eventually a full-size javelina presented itself broadside. The .308 got its turn. Through the scope I saw the pig collapse instantly, then tumble downhill for about ten steps – yes, it is steep country! The rest of the herd was certainly alerted now, but more confused than in panic. Amazing how little vegetation they can hide in! One of the young dummies ran right at me and made acquaintance with my boot. I watched their behavior, most of them departing uphill, and three downhill. It seemed than none really figured out what was threatening them, and where this threat was coming from. That changed when I finally moved from my position. Time to retrieve my prey. After tagging and the red work I even remembered to take a picture. Yes, there was a new Christmas gift involved in this hunt. The real work clearly came along the uphill track back to my vehicle. With plenty of stops to prevent uncontrolled sweating (and breathing), the journey took about an hour. 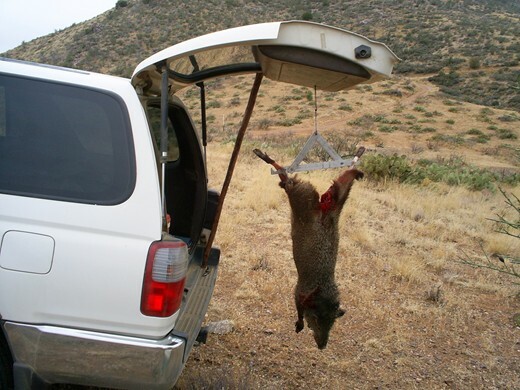 Experience showed that the 4Runner’s hatch, when propped up by a properly sized stick, supports a javelina just fine. Soon her hide was off. Oh yeah, another perfect thing that day was the weather. Solid overcast sky and slight wind made good meat cooling agents, while I enjoyed lunch. And speaking of perfect, up to then I had not seen another hunter, or their vehicles. After lunch I deboned the beast. All meat had nicely cooled. When alone on a perfect hunt, you fill your tag and return home on opening day before daylight runs out!